My 35th birthday is Thursday and some of you know I have very lofty goals for this year and plan to start it off with a bang… so here’s my birthday wish and gift to you. You can see the book description below. The book will launch at 11 am on my birthday, this Thursday, May 24th. We’d like to have a successful launch so would like to have as many orders as possible at the launch, between 11:00 a.m. and 12 noon EST (between 8:00 a.m. and 9:00 a.m. PST) Thursday. At first, it’s launching exclusively on the Amazon Kindle Store. If you don’t have a kindle, don’t worry. Kindle readers are free and they work on your computer (Mac or PC), smart phones, tablets, etc. You can read Kindle books almost anywhere, so if you haven’t started reading Kindle books, you should (for the huge selection at great prices). So why would you buy this 99 cent book and what’s my gift to you? • I typically don’t like to ask for anything. People ask me what I want for my birthday and I say, just take the amount you’d spend on me and give it to your favorite charity. I much prefer to give first and serve as many as I can. • In this case for my birthday, just a 99 cent present would kick start the launch that would allow us to reach more people so we can serve more people. • When you buy it, I’ll send you bonuses including the video of the presentation that inspired the book along with worksheets and .pdfs. • Also, I’ve worked on successful marketing campaigns for top celebrities and companies that have generated millions of dollars in sales and when you buy the book, I’ll be happy to share any advice or strategies on how to take your business to the next level. • …and if you’ll be in Atlanta the first week in June, I’ll be giving this presentation over lunch so let me know if you’d like a VIP ticket to the event. • If at any point in the future you choose to launch a book, just let me know & I’ll return the favor. Of course, we’d love for you to share this with others who may be interested. Feel free to forward this email along. Or, if you would like to see the book before sharing, please reply and ask for an advance copy so you can be confident in the material you are sharing. Also, if you have an email list and would like to send an email promoting the book launch to your list, please contact me for partner opportunities. We’ll send you a review copy of the book. In return, we offer referral fees and we’ll review your book, product or service and if it serves those on our list, we will promote it to our list. • http://RevStreamMarketing.com/revolutionize/ – This will be the promotion page on our site. It is not ready yet (the video and links are not added yet). If the link is live when you visit, please do not buy until the launch at 11:00 a.m. Thursday so it counts in our numbers. • http://www.amazon.com/dp/B0084X7YFO – This will be the buy page on Amazon. If it appears live when you see it, please do not buy until the launch at 11:00 a.m. Thursday so it counts in our numbers. Ready to revolutionize your business and life? It’s time to create the change you desire. Do what you love, earn more, work less and live the life you’ve always imagined. * Create lasting change in just 7 steps? * Generate more leads and sales on autopilot than with a team of telemarketers? * Give back to the world the way you desire faster than you ever thought possible? Indeed, it is. This is not just a business book. This is not just a spiritual growth book. Yet, it is both of these and so much more. Revolutionize Business & Life is the culmination of a quest spanning more than a decade by author, Patrick O’Donnell, to create the ideal life. From inspiring workouts and conversations with God to the latest marketing technology and business case studies, it’s all here. Have you ever gotten to a point in life when you said you must change something in your life… a relationship? Your body? Your career? In business, have you seen the changes going on around you and know you need to update your business to keep up with the latest technology and trends, but you haven’t yet? What better place than here? What better time than now? There are often three areas of life that we seek to improve: 1) family / relationships, 2) body / self, 3) career / finances. 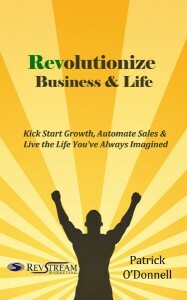 This book is meant to be that catalyst to start the revolution in your business, life, or both. It was written for entrepreneurs, but if you’re not interested in the business side, you can skip Part II. It’s Part II that’s all about how to revolutionize your business with the latest strategies and technology so you can earn more in less time, so you can spend more time with loved ones and give more to others. • Part I covers how to kick start growth and shows the 7 steps on how to do this. • Part II covers how to automate lead capture, follow-up and sales and shares the 7 ways companies are losing sales and what they can do about it. • Part III pulls it all together and covers the 7 ways to make change stick so you can live the life you’ve always imagined. And that’s just the beginning. You need the steps to kick start growth, automate sales and live the life you’ve always imagined. That’s exactly what Revolutionize Business & Life delivers.